In a new study from NSF International, a non-profit public health and safety organization, when 20 families swabbed 14 different kitchen items they found the following ones contaminated with various combinations of foodborne illness-causing germs such as E. Coli, Salmonella, Listeria and mold and yeast. (No wonder that 21 percent of cases of foodborne illness are due to food consumed in private homes, according to the U.S. Centers for Disease Control and Prevention.) Here are some of the worst germ breeding grounds, and tips on how to keep them clean. De-gunk it: NSF recommends that once a month, you remove the drawer from the fridge and wash the bin with warm water and a mild detergent. You can get rid of odors with a baking soda solution (about 1 to 2 tablespoons of baking soda in 1 quart of water). Let everything dry thoroughly. 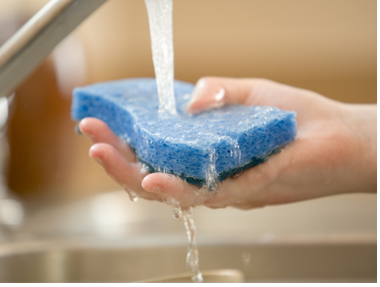 In addition to cleaning the sides and bottoms of your kitchen sink regularly it’s important to also clean your disposal on a regular basis to help prevent germs and odors. Clean a kitchen disposal with help from a senior product manager at NSF International in this free video clip.